A new Burger King restaurant in Waghäusel, Germany is hooked up with wind power, solar power, and lighting, heating and cooling systems that are expected to reduce energy costs by a whopping 45 percent and slash CO2 emissions by 120 metric tons annually! While we’re still looking at this story with a critical eye – no matter how many eco-friendly bells and whistles you put on a fast food restaurant, it doesn’t change the fact that it’s a fast food restaurant selling mass-produced, often very unhealthy eats – we’re excited that this one particular location has decided to up its green game. The wind and solar energy systems at the restaurant supply a third of its total electricity and were designed in collaboration with Wirsol Solar AG. The extensive list of green features at the site includes: an interior heat-recovery ventilation system which saves 73 percent of the energy that would be consumed for heating and cooling, waste heat to generate hot water saving 50 percent of the energy typically needed to heat water, interior and exterior LEDs which use 55 percent less energy that standard bulbs, a broiler that reduces gas consumption and related costs by 52 percent and electricity consumption and costs by 90 percent. The new restaurant in Germany also has a solar-powered electric vehicle charging station for hybrid cars and a rainwater reclamation system for landscape irrigation. The site also boasts more than 720 solar photovoltaic modules that can generate over 53,500 kWh of electricity per year, and a wind turbine that can generate about 2,500 kWh of electricity per year. The Burger King is an example of the company’s green vision, entitled Burger King 20/20, for all of its locations. 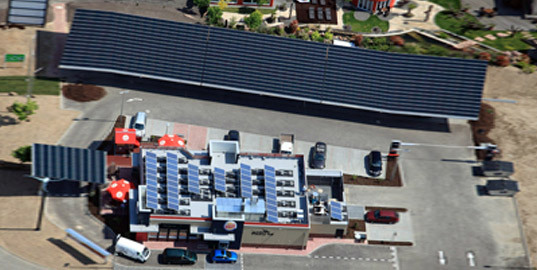 A new Burger King restaurant in Waghäusel, Germany is hooked up with wind power, solar power, and lighting, heating and cooling systems that are expected to reduce energy costs by a whopping 45 percent and slash CO2 emissions by 120 metric tons annually! While we're still looking at this story with a critical eye - no matter how many eco-friendly bells and whistles you put on a fast food restaurant, it doesn't change the fact that it's a fast food restaurant selling mass-produced, often very unhealthy eats - we're excited that this one particular location has decided to up its green game.